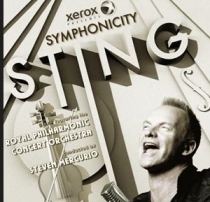 A whimsical statement of maturity - Sting indulges his fans by reworking his repertoire as an easy-listening evening... It was three years ago almost to the day that Sting and his old bandmates Andy Summers and Stewart Copeland played the Bell Centre for the first time in decades as part of the Police reunion tour. Sting's tunes, with a classical twist... It's not every former punk rocker who can offer you an intimate, sultry summer's evening by the lake with his favourite orchestra.